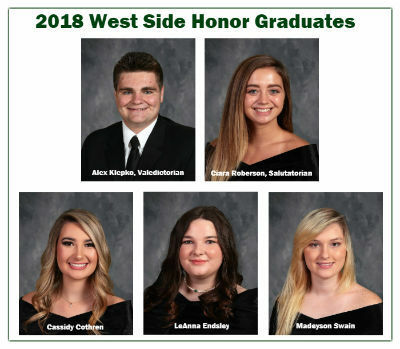 Alex Klepko has been named Valedictorian, and Ciara Roberson has been named Salutatorian of the West Side High School Class of 2018. Mr. Klepko, son of John and Amber McIntosh of Shirley and Brian Klepko of Memphis, has a 4.07 GPA. He took took Advanced Placement courses that enhanced his GPA, and he also earned concurrent high school and college credit. He plans to attend College of the Ozarks of Point Lookout, Mo. Miss Roberson, daughter of Charles and Tammy Roberson of Heber Springs, has a 3.85 GPA. In her coursework, Miss Roberson earned concurrent high school and college credit. She plans to attend the University of Central Arkansas in Conway to double-major in Political Science and Business. After UCA, she plans to attend the University of Arkansas School of Law in Fayetteville. Honor Graduates must earn a minimum 3.5 GPA and take either AP or college coursework; the top two are recognized as Valedictorian and Salutatorian. Cassidy Cothren, daughter of Zac and Crystal Cothren of Prim, who plans to attend Arthur’s Beauty College and later to seek a business degree. She plans to work for a hair product company, travel, and distribute products at trade shows. LeAnna Endlsey, daughter of Tony and Betty Endsley of Drasco, who plans to attend Henderson State University in Arkadelphia to major in chemistry (pre-medicine). She later plans to attend medical school and become a cardiovascular surgeon. Madeyson Swain, granddaughter of Melissa Osbahr of Drasco, who plans to attend Arkansas State University in Jonesboro to major in mechanical engineering. She plans to work for NASA.